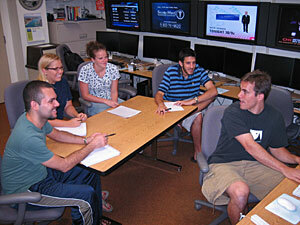 The University of Florida Interactive Media Lab was the first facility of its kind at any college or university. Its origins date to 1982, long before other institutions of higher learning began establishing programs in "new media." The current facility opened in the summer of 1994 with eight 486-class computers and a mission to explore the future of online news delivery. The lab, part of the College of Journalism and Communications, is a bustling center of activity with 15 state-of-the-art computer workstations, its own video- and audio-editing equipment and high-definition television monitors with Dolby Digital surround sound. Students monitor news from around the world on continuously updated computer screens and produce a weekly Web-based news magazine called Newszine. They also create Web sites for non-profit clients, produce interactive projects on DVD and CD-ROM and explore the future.